The Conference on Codification of Environmental Law was organised on the occasion of the presentation of the Draft Decree on Environmental Policy to the Flemish government. The Draft Decree was prepared by the Interuniversity Commission for the Revision of Environmental Law in the Flemish Region. It codifies and revises environmental protection law and has, to a large extent, been influenced by EC Law. The conference provided a forum for the analysis of experiences and plans for codification in a number of EC Member States, the role of international law in the codification process and the essential procedural and substantive difficulties to be dealt with in codifying national environmental law. This book will be published in conjunction with the English version of the Draft Decree and its detailed analysis, a publication which has been sponsored by the Flemish government. 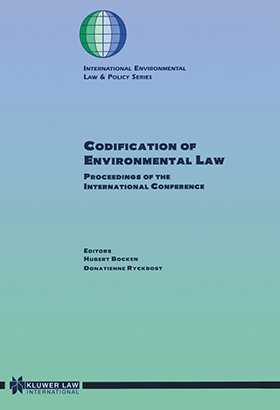 Towards the Codification of International Environmental Law?